Hip flexors, IT bands, and knees…oh my! So I broke down last week and went to a new chiropractor. I’ve been battling knee pain for a long time, but more recently, my hip has been killing me…literally to the point I’m limping for days after any type of run. I’ve blamed it on everything but running. Wearing high heels 5 days a week or having a 120+ pound lab pull me along on a walk/run, the lady at the shoe store evaluated my gait wrong and sold me the wrong shoes maybe? Nope. How about not enough pre run stretching and a tight hip flexor and IT band! She adjusted my left hip and low back, stripped my IT band, percussed my hip flexor and knee. It was heaven. I was walking without a limp and ran my fastest mile ever! By the end of the week, the pain was back. Then I ran a 5k and my knee was killing me about 3/4 of the way through. I did run with kinesio tape placed for IT band pain, but couldn’t quite get it to stick for my knee. That was yesterday, and today I feel like I’m 90! Should’ve left the tape on for today maybe. Back to the chiropractor tomorrow and I can’t wait! I ordered a percussion massager like she recommended to use before and after running, should be here next week. 31:06 5k….I was shooting for 30, but at least I did better than the last! I’m blaming the 3 hills back to back in the last mile stretch! Here’s how I spent the rest of my day after running! 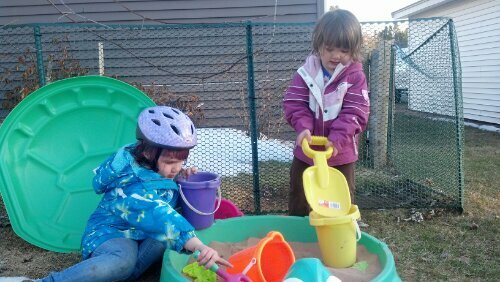 Bike rides and sandboxes 🙂 Gotta love grandkids! 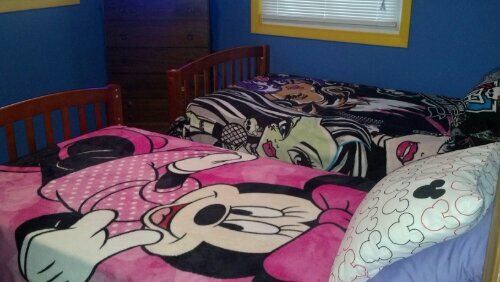 We also got them new beds and moved them into their uncle’s old room! They were happy, even if it smells like dog and boys in there… according to the 5 year old who fights with her 16 year old uncle like crazy! Happy Sunday from the couch!